I thought and thought and thought... and still I didn't wake up! 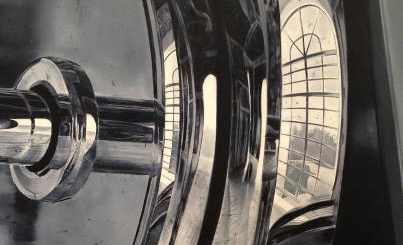 Image: detail from painting by Michael Zavros in his current exhibition 'Glass' at Tweed River Gallery, Murwillumbah. Kind of silly ... don't you think? I mean, it seems ridiculous to try and stop the thoughts. Have you ever?.... impossible!! I mean I agree that there can be a quietening, and/or a distancing from thoughts, but to actually stop them all together? Not possible. I'm not a meditator but I've heard a lot of people have tried over the years much to their disappointment. Then there is the idea that I just have to move beyond my thoughts to 'that place' which is awake! Have you ever tried that one too?... even more impossible!! I mean, where is this place that is beyond thought? Surely it can only be 'the mind' or just another thought that says there is a place to get to. My awake friend once told me that if you are referencing 'time' or 'object' you are still in 'the mind'. I don't know about you, but I am finding the trying to work this out, the trying to get somewhere, the trying to stop thinking, the trying... trying... trying... EXHAUSTING! I'm not sure what the answer is... perhaps there isn't one. Perhaps it is just another thought, just 'the mind' that is seeking an answer. I'm not sure what to do or don't... perhaps this isn't it either.